Through my own work and life experiences, I’ve been blessed with knowing many of the most gifted and professional psychics and mediums in the world. I’ve also been blessed by knowing a few readers that I wouldn’t send my lovelorn, down-and-out pet chicken to (if I had a pet chicken, that is). There are definitely some qualities both groups of readers have in common. In Psychic Scams, I cover a lot of the red flags you should watch out for and avoid. This article will focus on what to look for or seek out when choosing a reader. First and foremost, (I can’t say this enough), trust your own intuition. You have a built in inner guidance system that will not lead you astray if you’re paying attention. If you’ve made a blunder in the past, examine it and see what you can learn from it. Many years ago, I sat for a reading with a psychic who was absolutely horrible. Not only was she an egomaniac, she didn’t even really listen to me or tell me anything. When she wasn’t shooting down my dreams, she just talked about her own life and plans the whole time. When I looked back at the experience, I realized that I had had a negative “twinge” when I decided to go to her, but I had ignored it. Even “psychics” need wake up calls that remind us to LISTEN and pay attention to our intuitions now and then! It turned out to be a very positive experience, for it clarified and came to represent everything I don’t want to be as a reader myself. How do you access information? Do you consider yourself a “medium” or a “psychic?” (A medium can bring through messages from Spirit, while a psychic generally reads your own energy or taps into impersonal sources of information. Both should be able to tell you where things are heading in your life and what is lining up for the future. Note that I’ve never met a medium who can guarantee communication with a particular Spirit, so be wary if someone promises you this. That kind of communication is definitely a two-way street, and many variables come into play). 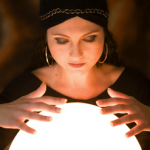 Are you clairvoyant, clairaudient, or clairsentient? Do you use any special tools like tarot cards in your work? How long have you been reading professionally? Do you have testimonials available? (Don’t expect references, as an ethical reader will never disclose any information about her clients). How much do you charge, and what does this include? Do you charge by the question, or by the amount of time we spend? While we’re on the subject of money, be wary of readers who charge exorbitant sums for their work. While it’s only reasonable to expect to pay for a gifted individual’s time and talents, readers who charge hundreds of dollars an hour are clearly putting money ahead of other priorities. I hope we don’t even have to mention those criminal 900 lines or their internet equivalent: sites with hundreds of anonymous, faceless readers charging by-the-minute rates that add up to hundreds of dollars/hour. Ask yourself if you feel comfortable with the reader, if you feel a good rapport. Do you feel emotionally safe sharing your heart’s desires and your deepest concerns? Trust is essential; you must feel safe opening up and really communicating with your spiritual counselor. Getting a good psychic reading involves more than choosing the right reader; you must also be a good read-ee! It’s a synergistic and co-created endeavor. Once you feel comfortable with a psychic or spiritual counselor and have decided to pursue a reading, it’s time to prepare yourself in order to make the most of the experience. First, ask yourself why you’re pursuing the reading. Do you just want to hear what you want to hear? Are you ready to face the truth, and to take action to create desired changes? Are you truly ready to be honest with yourself and take responsibility for your life? Often clients will seek out reader after reader, just waiting and hoping to find one who will tell them that yes, even though Billy is abusive, alcoholic and just plain mean, even though he just married another woman and moved halfway around the planet, he is her soul mate, her loves her, and he will be back for her. Of course, this is making light of what is always a serious situation, especially to the person asking the questions. In this type of scenario, the client has already made up her mind about how things have to be; she is not truly open to hearing what the reader brings through. Make sure you’re ready and willing to hear what is communicated. It doesn’t mean you have to accept what you hear, but make sure you’re really open to listening to all the possibilities. On a similar note, holding back information to “test” your psychic generally backfires. Occasionally a client will be mysterious or ask the barest of questions in order to see if the psychic is “for real.” It’s best to open up your mind, heart and energy to the reader, and then evaluate how accurate they were AFTER the reading. If you can’t take a leap of faith after you’ve gone through a careful selection process in choosing the reader, it’s unlikely you’ll be open enough to get much out of the reading. The more open you are, the more detailed and specific the reading will tend to be, especially if the reader uses something like tarot or another divinatory tool. This doesn’t mean you have to feed the reader all the answers, it just means communicating what your concern is and being open to being read. Keep in mind that nothing is set in stone. Some matters are more predetermined than others. There are times in a reading when I know things are going to go a certain way, for it’s all aligned, and the client is on the verge of the experience. It may be that someone from a past life is about to re-enter their experience, or a new job opportunity is already on the horizon. Other times, it’s clear that what will happen depends almost entirely on the choices the client makes. Your reader should be able to tell you how much power you have to control what is predicted, and how to go about creating what you do want. Don’t ever resign yourself to anything a psychic tells you. The power of getting a reading is that is shows you where you’re heading so you can change your course if you so desire. Above all, a good psychic reader will leave you feeling comforted, more at peace, and empowered to create what you want in your life. Your concerns should be clearer, your heart lighter, and your hope for the future burning brighter. If you use your intuition and common sense in choosing a spiritual counselor and you prepare yourself for the reading, you can work with the synergy and magic of the reading experience to change your life and fulfill your dreams!